eBay PaymentShippingReturn policyAbout usContact us Store category OtherSmart Bluetooth WatchProjector TabletVR GlassesBrick PhoneCar DVRPhone & AccessoriesHome ImprovementSports DV3D Printer AccessoriesFM SpeakerShower head& Water FaucetRemote Control Car Sign Up Now ! 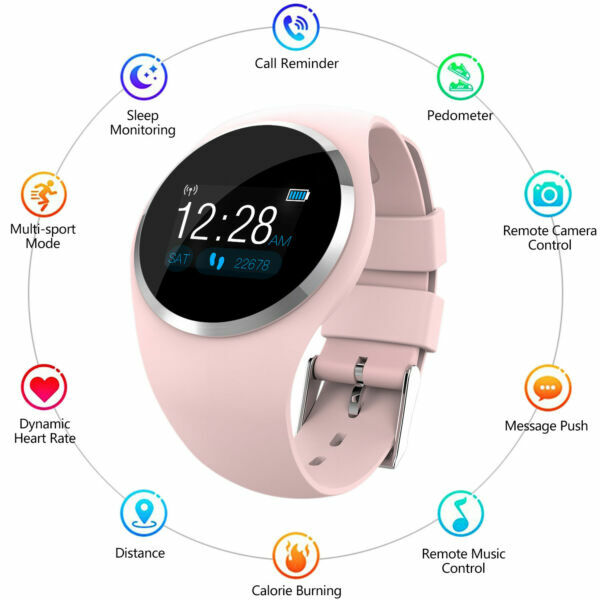 You may also like Women&Girl Waterproof Bluetooth Smart Watch Ladies Phone Mate For Android iPhone Product Description Women Waterproof Bluetooth Smart Watch Ladies Phone Mate For Android IOS iPhone Product Description Features:Health monitor: Real-time heart rate measurement (dynamic, static), blood pressure, (Timed blood pressure measurement can be set), oxygen monitor, fatigue monitorReminders: Alarm, drink reminder, sedentary reminder, incoming call reminder, notification (SMS/QQ/Wechat/Skype/Facebook/Twitter/Line/WhatsApp), anti-loss alert, palming for bright screenOthers: one key examination, time display, remote camera, DND mode, find the bracelet, Wechat movement, customize the home page style, reject a call on the smart bracelet, support APP air upgrade, personalized settingsParameters:1. Product model: For Q1 smart bracelet2. Product color: black, white, pink, green, gray3. Chip: NRF52832_QFAA4. Bluetooth: Bluetooth 4.05. Memory size: 512KB+64KB6. Compatible systems: For Android 4.4 and above, iOS 8.0 and above7. Waterproof grade: IP678. Screen: 1.0 inch TFT LCD color screen, resolution: 128*969. Touch mode: single touch panel10. Battery: 170mAh lithium polymer battery11. Charging voltage and current: 5.0V, 85MA12. Charging head specification: charging ≤ 1A13. Charging mode: spring contacts14. Standby time: standby for 60 days, normal operation for 7 days15. Product size: diameter: about 40.0mm/1.57in, thickness: about 10.6mm/0.42in16. Product net weight: about 41gAPP Languages:Simplified Chinese, traditional Chinese, English, Japanese, Korean, Spanish, German, Italian, French, Greek, Turkish, Russian, Dutch, PortugueseNote:1. Please charge it before use!2. Do not use the smart bracelet in seawater, hot or lukewarm water!Packing List:1 * Bracelet1 * Charging Cable1 * Instruction Payment Delivery details Terms of sales About us Contact us Payment We accept PayPal only. Payment must be received within 3 Days from the date of purchase. Please leave note in PayPal when making the payment if you have any special request (colors/size). Orders will be processed instantly and dispatched in same day normally, so we do NOT accept any Email/Message note before or after you place orders. Delivery details All the items will be dispatched within 3 business day after the payment is clear. Items will arrive in 3-7 business days. The arrival time depends on some factors and different areas:Please choose some local sellers, if you cannot wait patiently in the shipping time we declared.Once you purchase, please DON’T leave negative or neutral feedback if you haven’t received item in 30 days, feel free to contact us and we will do our best to solve it.Customs duty is obligation and liability of a citizen in your country, so buyer should be responsible for any tax and custom duty incurred. Generally, the delay or failure delivery is sometimes caused by the policy of different customs. For example, Laser Pointer is unacceptable in some countries. Therefore, please double check your local customs policy carefully before purchase. Or, we will NOT be responsible for any failure delivery related destination customs issue. Terms of sales All the products we are selling include factory warranty, don't cover items that have been abused, burned and damaged in any form. Please contact us via eBay Message if you have NOT received item in 30 days, we will check it with post office, and then resend or refund any missing item. In the unlikely event that your product is faulty in anyway, you must contact us ASAP and then return it within 7 Days of receipt. The postage and packaging fee will NOT be refunded. We will not be responsible for the delivery or insurance charges incurred in returning item back to us. If you return an item purchased from us, it must be back in Factory Condition. This includes packaging, inserts, manuals etc. Please allow up to 5 Working Days for us to process your returned item. About us We have our Factory, specialize in manufacturer all electonic products, include smart watch,tablet and accessories,and robots. We can make sure the item we offer is the most competitive and wholesales price. Contact us If you have any questions, please feel free to email our service specialists 24 Hours a Day, 7 Days a Week. We will reply you ASAP. If no response within 24 Hours, please check the spam in your mail box. We greatly appreciate your POSITIVE feedback. Please Do NOT leave negative feedback without asking for help. Our aim is to provide Top Level Customer Service, normally so we will try our best to solve any problem. Please DON’T leave negative or neutral feedback if you haven’t received item in 30 days, because we have mentioned the shipping time repeatedly.